Oregon is the nation’s top grower of flowering trees, logging almost $50 million in sales in 2014. Two bestsellers are flowering cherry ($8.2 million) and flowering plum ($3.1 million). Flowering cherries have the advantage of thriving in most temperate zones across the United States and particularly in the Pacific Northwest, where historically they have been planted in larger commercial and residential designs. According to one estimate from Portland Parks and Recreation’s Urban Forestry division, 6 percent of the city’s trees are flowering cherries. But in recent history, sales of these two spring stunners have been waning in commercial and urban forestry circles, even as they still capture the hearts of residential customers. Four factors have affected sales of flowering cherry and plum trees: The Great Recession of the late 2000s; urban forestry plans for diversity versus monoculture in replacement species; the move toward smaller or more upright trees; and the desire for lower maintenance trees with drought tolerance and disease resistance. “Plum and cherries have a reputation for high maintenance,” said Jill Rodriguez, B&B container sales manager at Arrowhead Ornamentals in Hubbard, Oregon. Plums in particular have a reputation for suckering and fruit drop. “Some of the older ones are messy, but the new ones are not,” Dixon added. Newer varieties of flowering plum provide enough fruit to attract birds without being messy, and newer varieties of flowering cherry are bred for disease resistance. Although the urban applications for flowering cherry and plum trees have lessened, they are still in high demand with homeowners nationwide. The residential customer loves them for the flower displays and the range of bloom times, starting as early as late February and going through late April. There is a historical connection, too — to the flowering cherry trees received in 1912 by the United States from Japan. Those trees stand as a monument to spring and draw more than 700,000 visitors each year to Washington, D.C. When people see them in bloom, it leaves an impression. In early April this year, Jim Browne at Sester Farms in Gresham, Oregon, received half a dozen calls from garden centers in the Midwest looking for flowering cherry. The catalyst for those calls? The spectacular display of flowering cherry trees in our nation’s capital, he said, where customers had recently visited. They wanted to recreate that particular look in their own gardens. In a horticulture world where new cultivars are constantly sought, flowering cherry and plum remain popular. Reviewing The Handbook of Landscape Tree Cultivars by Willet N. Wandell (1994, East Prairie Publishing Co.), Buley was surprised to find that “some of the oldest cultivars remain the most popular and widely grown and planted,” she noted. Buley said the top sellers among the ‘oldies but goodies’ in order of sales volume are: P. serrulata ‘Kwanzan’ (1913, EH Wilson), P. × yedoensis ‘Yoshino’ (1902), P. ‘Okame’ (1946, Morris Arboretum of England) and P. × yedoensis ‘Akebono’ (1925, W.B. Clarke of California). P. cerasifera ‘Thundercloud’, introduced by Housewearts Nursery (Oregon) in 1937, is J. Frank Schmidt’s and Carlton Plant’s top-selling plum. 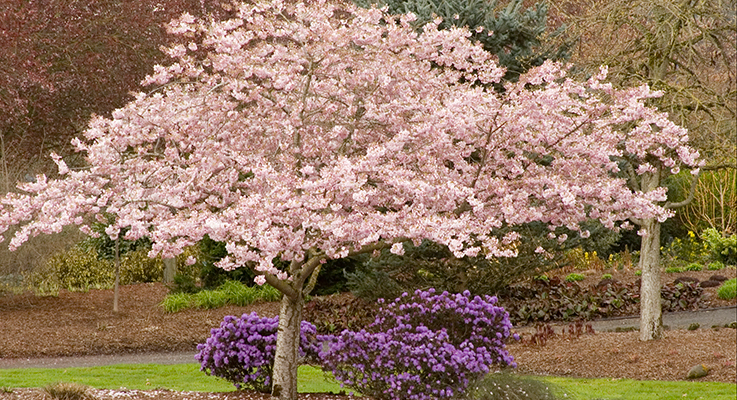 P. ‘Kwanzan’ is the most heavily planted cherry in the Pacific Northwest and the United States. It has a showy deep pink double bloom and an upright habit as a young tree and spreads as it matures; the height is close to the spread, at about 20–30 feet, with a V shape. It is a mid-season bloomer with no fruit and bronzy orange fall color. ‘Kwanzan’ and ‘Yoshino’ are the varieties of flowering cherry planted in Washington, D.C. ‘Yoshino’ has upright, single white fragrant blossoms, insignificant fruit, and matures at 10–20 feet, with good fall color. ‘Akebono’ is especially popular in the western United States. This variety “tends to have more pink, close to the original ‘Yoshino’ cherries in D.C., which affects customers’ choice. What they see, they want,” said Carlos Oliveira, general manager at Blue Heron Farm in Corvallis, Oregon. ‘Akebono’ is the flowering cherry you’ll see on Portland’s Tom McCall Waterfront Park. It also has the distinction of proven disease resistance, even in the wet Pacific Northwest, which earned it a Great Plant Pick designation in 2003. So revered are ‘Kwanzan’ and ‘Yoshino’ that even the average lifespan of 35–50 years doesn’t deter people from planting them. However, their larger size does stop some homeowners. Compact varieties are seldom used as street trees, but they have major landscaping potential elsewhere. Snow Fountains® (P. × subhirtella ‘Snofozam’), for instance, is a weeping cherry that tops out at 12–15 feet. It is popular not only for its compact habit but also its showy, fragrant white flowers on bare stems and golden autumn color. Pink Snow Showers™ (P. × ‘Pisnshzam’) is slightly taller at 20–25 feet, yet still fits within smaller landscapes and wows with double pink blooms and a deep golden fall color. A version of ‘Kwanzan’, P. serrulata ‘Royal Burgundy’, was discovered by Frank Parks of Speer & Sons Nursery in Woodburn, Oregon, and released commercially in 1990. ‘Royal Burgundy’ is a slower grower than ‘Kwanzan’ and matures 10 feet shorter than its parent, topping out at 20 feet, and has rich dark purple foliage against darker pink blooms for an impressive display. P. incisa ‘Kojo-no-mai’ is also worthy of greater consideration, Oliveira said. It matures almost at a shrub height of 5 feet tall by 5–6 feet wide, and with delicate single, light pink flowers and a beautiful dark mahogany fall color. P. serrulata ‘Shirofugen’ blooms late, after the spring rains, making it less prone to diseases than other early-flowering cherries. Disease and drought tolerance are sought-after traits because homeowners don’t want to spray and municipalities don’t want to water, especially street trees. Oliveira said ‘Shirofugen’ is a little more vigorous than ‘Mt. Fuji’, with the same spreading habit and about 10 feet taller, maturing at 30 feet. Among compact cherries, everyone is talking about Prunus incisa ‘Carlton LT’ Little Twist®, introduced by Carlton Plants in 2009. Touted for residential plantings, Little Twist is a dwarf flowering cherry that offers a lot for its 8-by-8-foot frame. Its name derives from the attractive zigzagging branches. In spring, clustered white flowers with pink centers can last three to four weeks; in fall, leaves turn orange to deep maroon. After trialing it for 10 years, JFS chose this tree for its foliage, which stays good-looking over time, as well as its vigor, attractive bark and upright stature. It blooms later than other flowering cherries, so buds are less likely to get nipped by frost. “It’s like the Sargent columnar cherry, but not as narrow,” Buley said. And it is hardy down to USDA Zone 3. The new weeping cherry with bright pink flowers Buley’s really excited about is Pink Cascade®. It has fine-textured foliage and good vigor on a graceful 12-by-12-foot frame. It has wide market appeal, she said, for its good heat resistance that does well in the Southwest, where many cherries don’t. Last year JFS introduced First Blush® cherry, an upright and narrow grower to 25 feet by 12 feet — “but not too tight,” Buley said. It has fragrant and dense semi-double flowers, dense foliage and good fall color — attributes that would make it a good small street tree. “A lot of people look their noses down at them, because they’re short-lived and they tend to have storm damage problem, but when you see plum in the spring you tend to go, ‘Ah!’” Buley said. Although JFS carries the same number of plum varieties as they do cherry, their inventory is twice as many cherry trees. And that is similar for other nurseries, even as plum shines for its foliage display and compact habit. Featuring deep purple foliage and light pink flowers, P. cerasifera ‘Krauter Vesuvius’ is a moderate grower to 20 feet. A top seller for many growers, it handles heat better than P. cerasifera ‘Thundercloud’, the second most popular plum, and both have little to no fruit production and need little to no pruning. P. cerasifera ‘Purple Pony’ is an underutilized dwarf flowering plum with incredible heat tolerance and sterile habit that avoids messiness. ‘Purple Pony’ is also stronger, and fits a smaller yard, maturing at 10–15 feet.